Yamaha xp 500 2007 t-max abs. 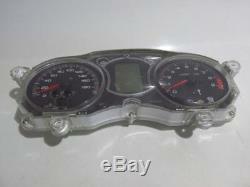 Dashboard meter good condition - mileage: 38000 - some marks and scratches p1d1j01203 yamxp com0111435. Our parts are pre-packed in our warehouses, so it is impossible to take measurements on parts for possible adaptations. Our parts are checked for dismantling in our workshops and before shipment. If you have any doubt about compatibility with your vehicle, please contact us with your. Brand / model / cm3 / year / serial number. The item "yamaha xp 500 2007 t-max abs" is on sale since Friday, October 26, 2018. It is in the category "auto, motorcycle parts, accessories \ motorcycle parts \ other".